Regular connection Joyeuse Sablières / Sablières Joyeuse every Wednesday. Price: 5 euros return trip. 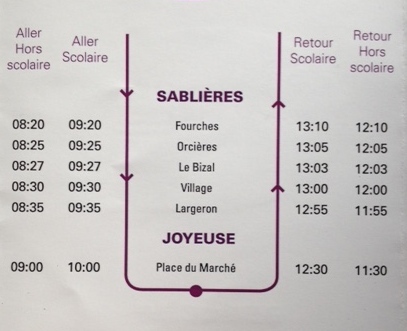 Reserve at the latest the day before the journey prior 5 pm by giving name(s), the number of persons to be taken, a telephone number where you can be reached, the commune of care and the stopping point. If you are unable to attend, please cancel the day before your trip. Contact: 04.75.91.34.86 (Monday to Friday, except public holidays, between 8.30am to 12.00pm and 2 pm to 5 pm).